New Hope for Children Orphanage: RECRUITING FOR "HELPING HANDS 300" ARMY OF THE LORD! RECRUITING FOR "HELPING HANDS 300" ARMY OF THE LORD! and shouting "the sword of the Lord!" Do you remember the account of Gideon's Army (Judges, Chapter 7)? Gideon's army of 22,000 was too big. So God reduced Gideon's army to just 300 valiant warriors to face the huge army of the Midianites. 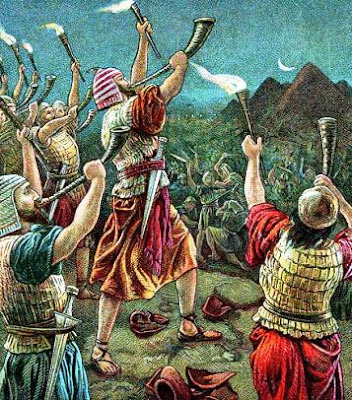 Then, armed with trumpets and torches, Gideon's army conquered the Midianites and chased them out of the country. Going into battle with "impossible" odds, Gideon and his army knew who was to receive all the glory and honor for the victory: almighty God! We now have about 100 partners with New Hope for Children ministry. We are praying that God will bring us 200 more individuals and families who will be the "Sword of the Lord" in India! You can read more about Helping Hands India and New Hope Orphanages here. If you are not already partnering with us, please consider joining the "Helping Hands 300" army of the Lord in India! You do not have to sponsor a child to join "Helping Hands 300". Everyone who contributes $10 or more per month will be an official member of God's "Helping Hands 300" army in India! If you are not already partnering with us, you can JOIN TODAY by setting up your donation on our secure online donation page. Just click on JOIN TODAY. You can contribute with credit card, debit card, or direct deduction from your checking account. If you do not wish to contribute online, you can print out our paper donation form and mail it to us. Please bless our children today by joining "Helping Hands 300" Army of the Lord!